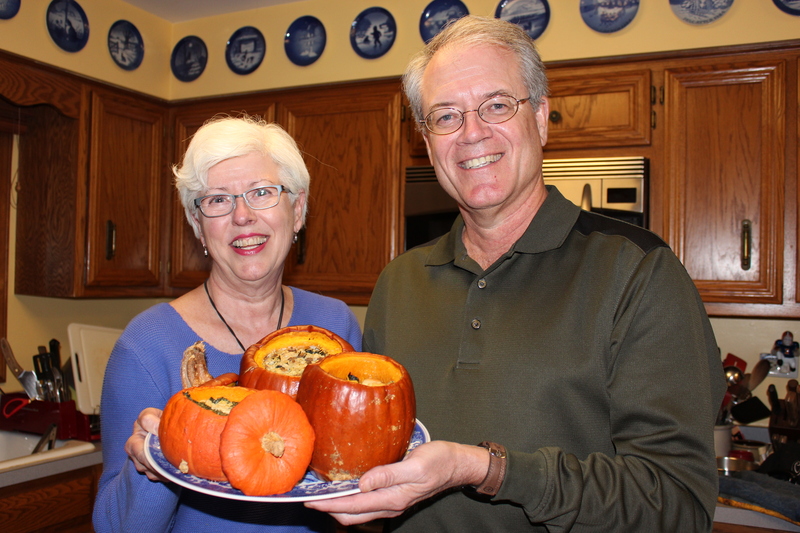 Recently I asked my brother John to do a guest post on the stuffed pumpkins he makes, but when he sent me the recipe I changed my mind. Instead of a guest post, I decided we should do a joint post! He’s been telling me about these pumpkins for a couple of years, but I’d never attempted them. Since I was travelling to his house for Thanksgiving, I thought it was the perfect opportunity to learn from the master. Since there were so many options for the stuffing, we decided to experiment with three slightly different fillings. I thought it would be fun to report on the results of the variations. Uncle John says . . . 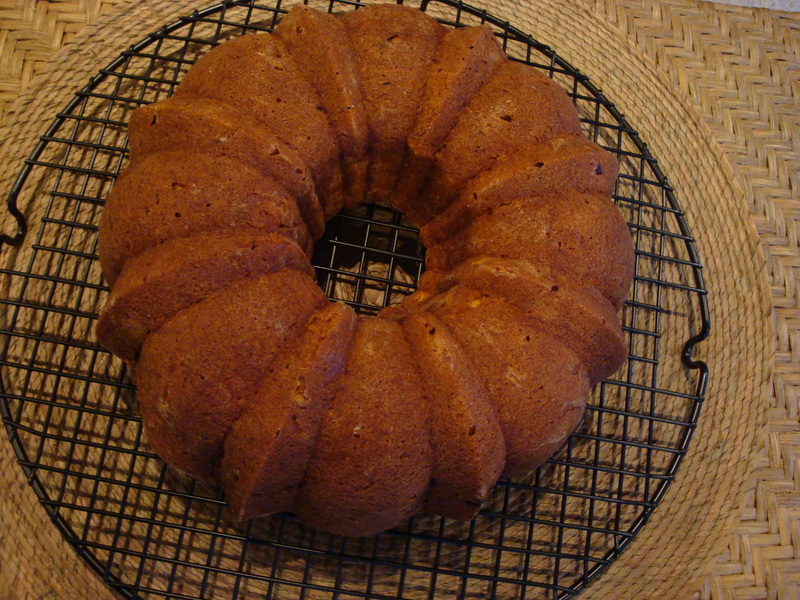 This recipe comes from an NPR story from a couple of years ago featuring Dorie Greenspan’s stuffed pumpkin recipe. This struck me because I was looking for something to do with winter squash beyond the typical sweet recipes made with butter, brown sugar or maple syrup. I particularly liked the flexibility of Dorie’s recipe – you can use many different approaches to the ingredients and proportions of the stuffing. 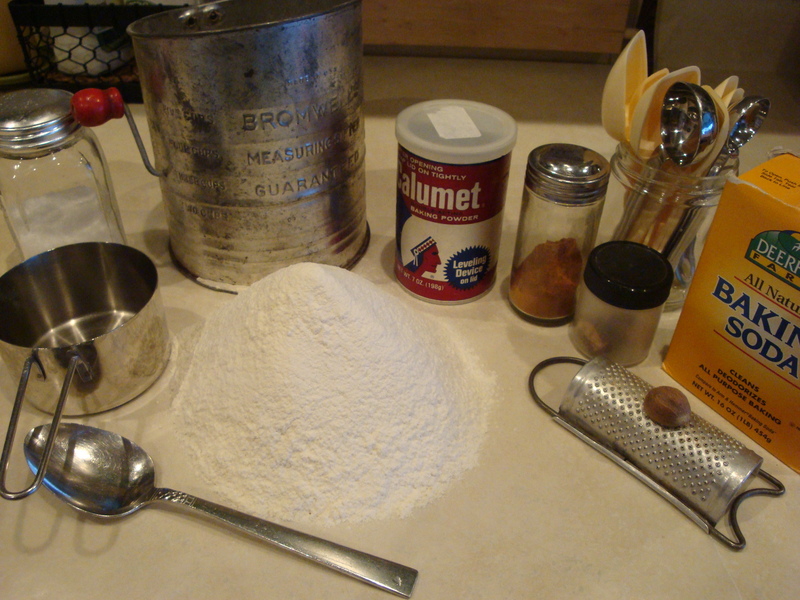 I’ve experimented over the last couple of years and landed on our favorite ingredients. I’ve also developed a philosophy of how to make sure you have the right amounts and proportions. I’ve never had anyone eat these pumpkins who didn’t say “wow!”. Start with the pumpkins: Select pie pumpkins at about 3 pounds. This size will serve 2 people as a main dish and 4 people as a side. In our experiment, we tried a red kabocha squash and thought it superior to the traditional pumpkin, but either work well. 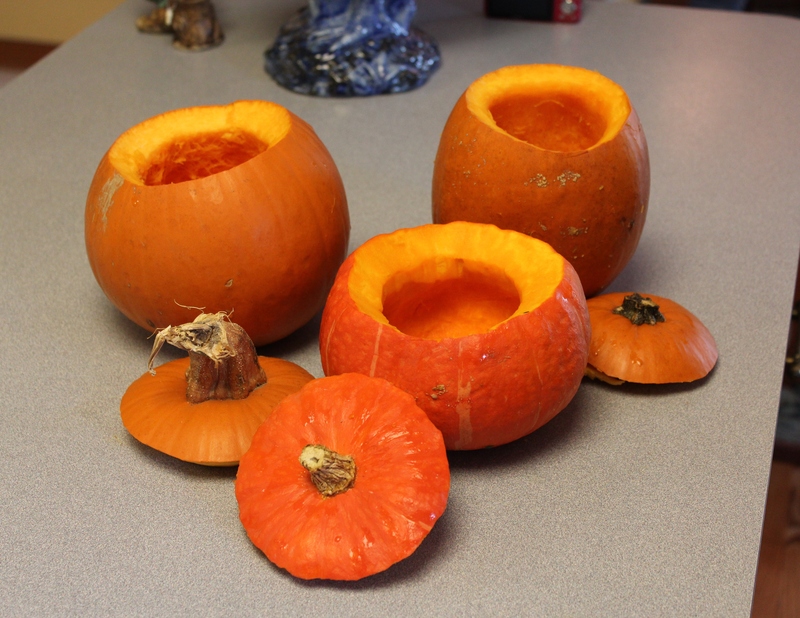 Cut a “lid” out of the top of the pumpkin/squash by running a sharp knife around the top at a 45-degree angle. Set the lid aside – do not discard. Scoop out the seeds and use a spoon to remove the strings from the flesh. Wash out the cavity and then dry with a paper towel. Determine the amount of stuffing: Uncle John’s trademarked technique is to fill the cavity with water and then pour into a measuring cup. This will tell you the capacity of the pumpkin, determining the total quantity of ingredients. Decide on your ingredients: The stuffing is comprised of a starch base, a meat flavoring, cheese (optional), vegetables, aromatics and spices – the exact ingredients and combinations of which are variable. Here are some guidelines. 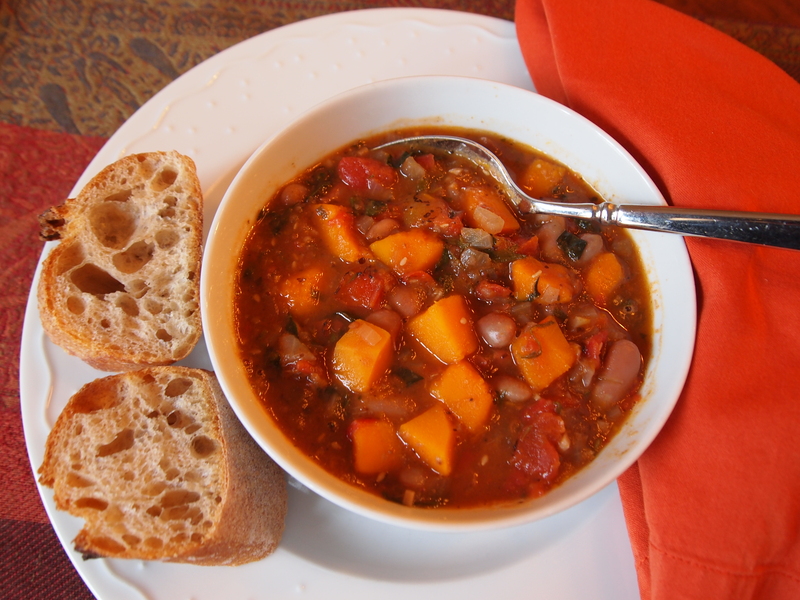 Starch base options – cooked brown rice and stale bread cubes will form the base. We cooked both and liked the rice better, but the bread was good as well. Meat flavoring – we used sage breakfast sausage and bacon and think ham would work as well. Whatever your choice, it must be cooked prior to combining with the other ingredients. I can also see a vegetarian version with a combo of chipotle peppers and chickpeas or black beans. Cheese – we used sharp cheddar with sausage/rice stuffing and pepper Jack with bread/bacon. Gruyere, Swiss, blue and Parmesan would all be good options. 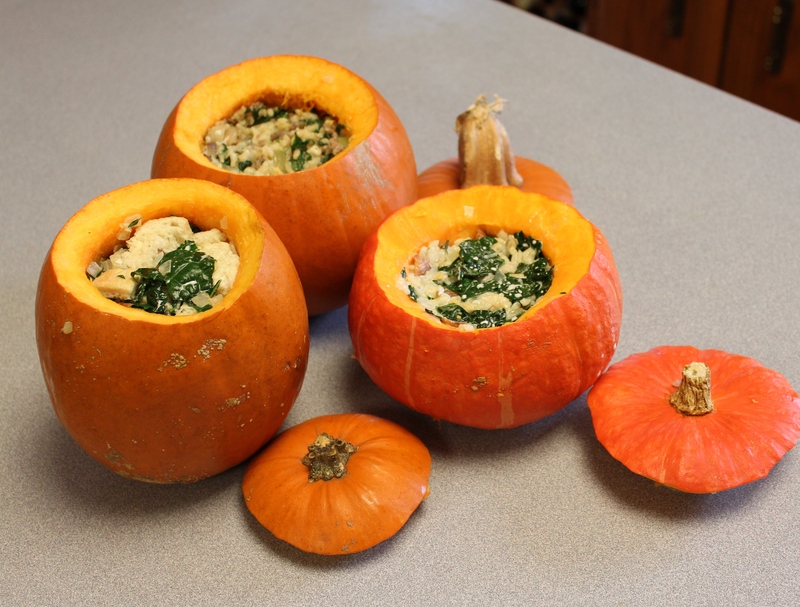 We made the kabocha without cheese and it was delicious. 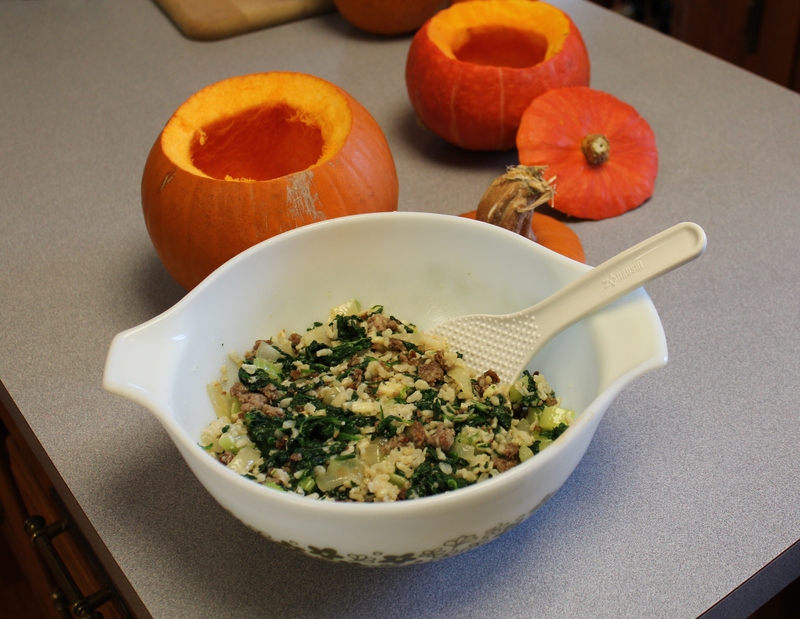 Vegetables – we used cooked spinach and cooked Lacinato kale and thought the kale more flavorful as well as substantial. Cooked Swiss chard, peas and Brussels sprouts leaves also sound good. Aromatics and spices – for savory fillings you will want sauteed onions and garlic at the least. Add celery, carrots and bell pepper to your taste. We used fresh thyme and in the bread stuffing added nutmeg. 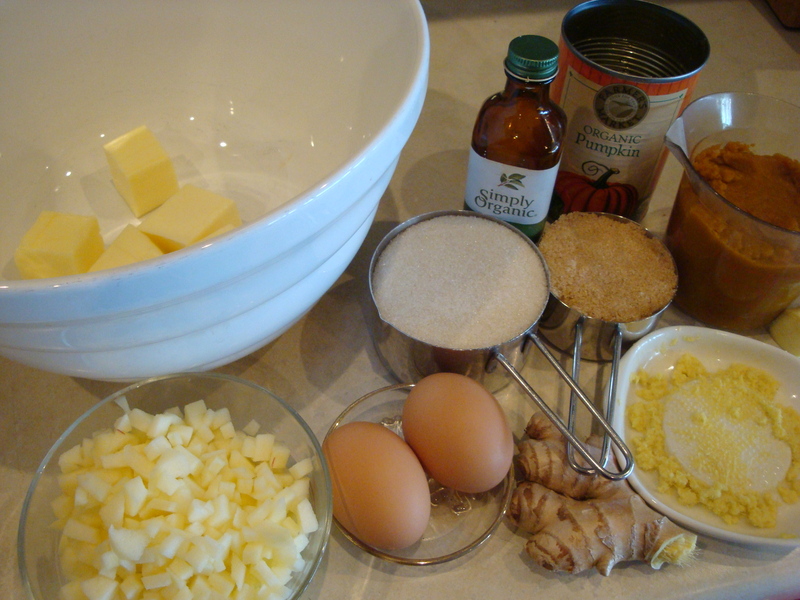 Binder – heavy cream or half and half are recommended to bind the ingredients together. We think stock could be used for a non-dairy version. 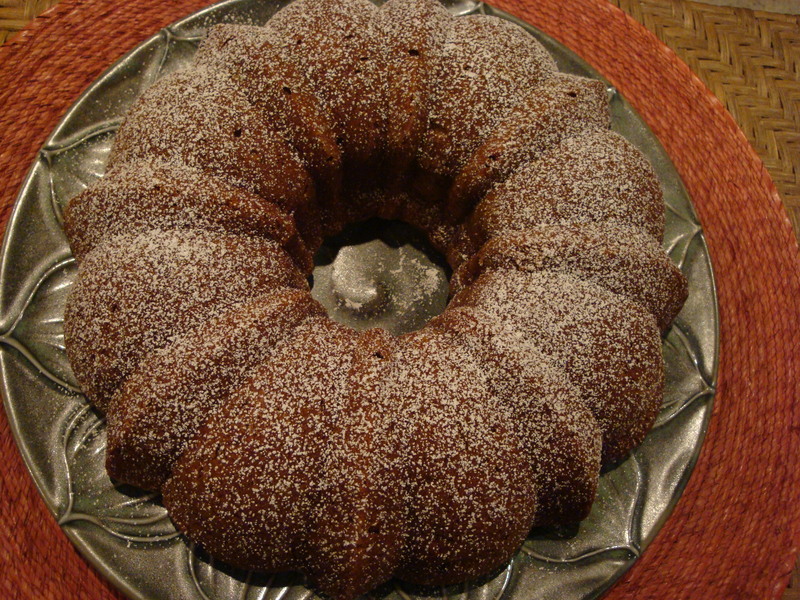 Other options – I’d like to try this with nuts and fresh or dried fruits. Speaking of which, you could take this in a whole different direction with a sweet rice or bread pudding approach to the filling. But that might have to be another blog post. 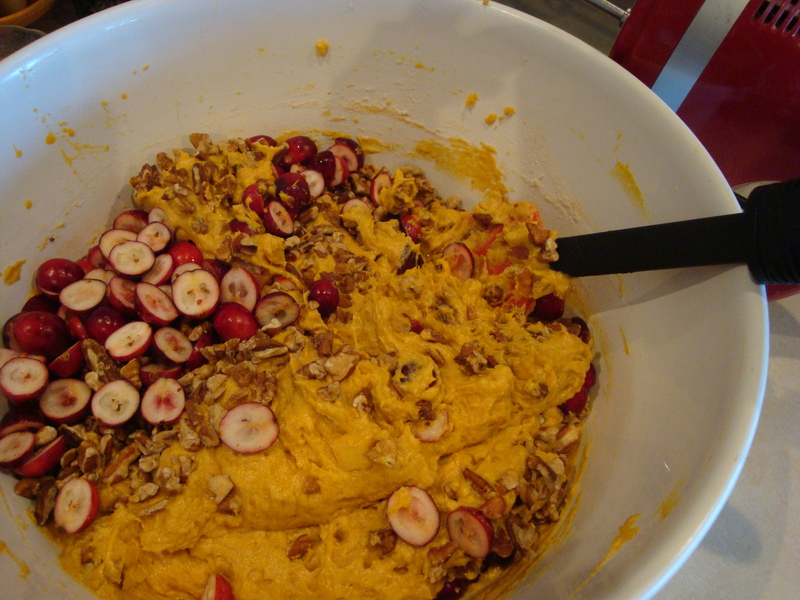 Prepare the filling and stuff the pumpkins: Combine all stuffing ingredients in a bowl. A guideline is roughly 1/3 starch base, 1/3 meat and 1/3 vegetables, which you can vary according to taste. To this, you’ll add the aromatics, spices and other ingredients until you get slightly more filling than the capacity of the cavity of the pumpkin/squash. Place the filling in the pumpkin and pack down. Add 1/4 to 1/3 cup heavy cream, half and half or stock. Place the “lid” back on the pumpkins. 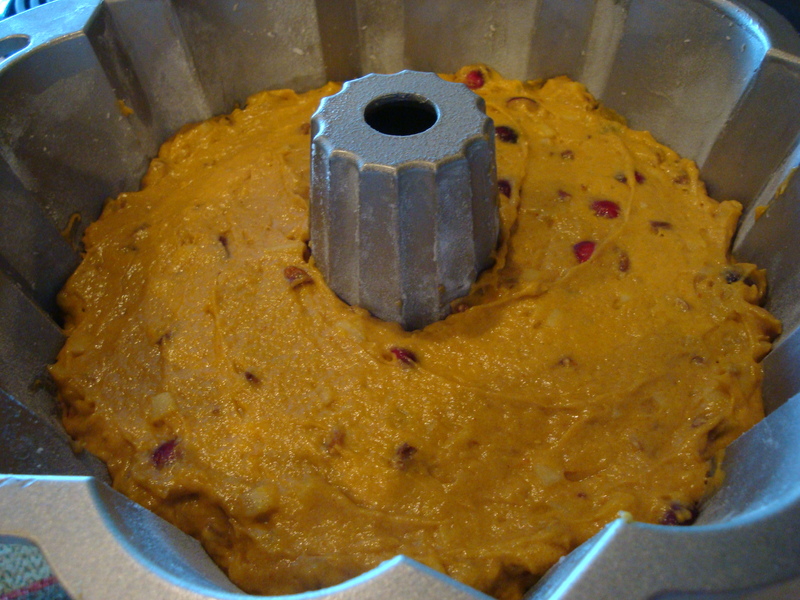 Baking the pumpkins: Place the stuffed pumpkins on a foil-lined baking sheet. Place in the center rack of a preheated 350 oven and bake for about 90 minutes with the lids on. Don’t be alarmed by the liquid escaping from the pumpkins – that’s natural. After 90 minutes take the lids off and bake another 20-30 minutes. Remove from the oven and let sit for 30 minutes. Serving: Depending on size, cut in half or into wedges to serve. 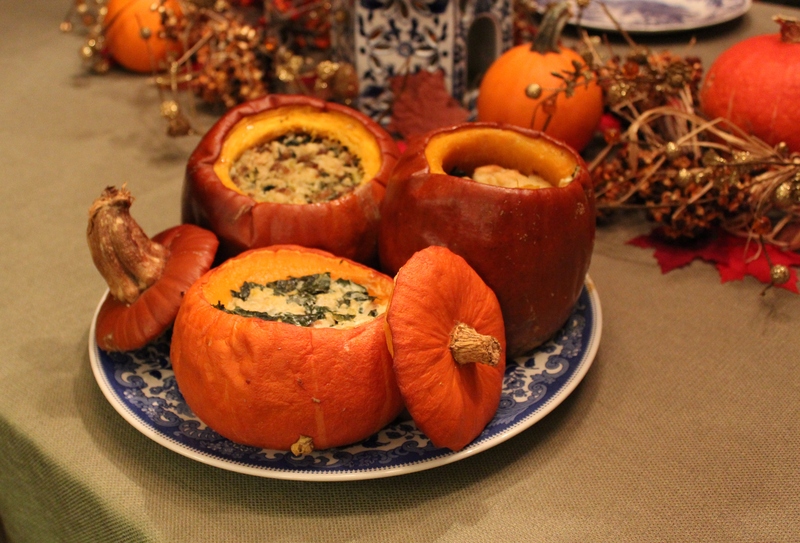 Or if small, individual pumpkins could be served to eat right out of the shell. Making ahead: These reheat really well in the oven. 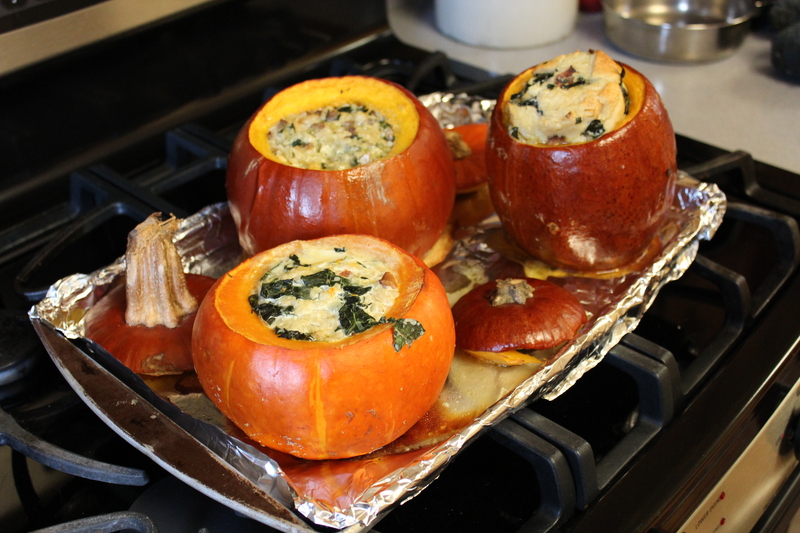 We made the pumpkins in the morning, then cut in half, put back on the baking sheet and baked at 350 for 30 minutes. Delicious! !